Curry leaf benefits the body by stimulating digestive enzymes, reducing body heat, relieving kidney pain, controlling Diabetes, making the eyes appear brighter, retaining the natural pigmentation of hair, and so on. 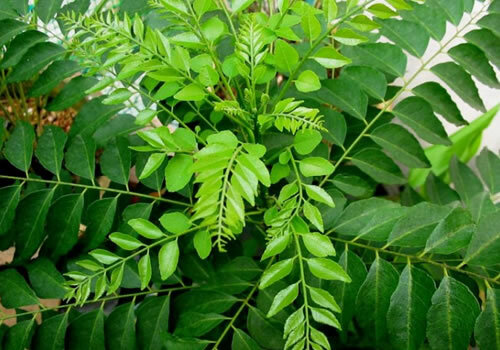 Moreover, curry leaves are used for flavoring in South Indian cuisine. The herb is also used in Sri Lankan and West Coast Indian cooking. These tender, fern-like leaves have a spicy aroma and tangy flavor. Other Names: Sweet neem leaves, Krishna nimba (named after Lord Krishna), Meetha neem, Kadhilimbdo, Kariveppilei, Kari bevu, Jhirang, Gandla, Karepaku, Karapincha, Barsan, Barsanga, Narsingha, Kariaphulli, feuille de cari (French), foglia di cari (Italian), etc. Curry leaf tree is native to India. It grows in tropical and sub tropical climates. This herb also grows in Sri Lanka, Burma, Malaysia and South Africa. Apart from the leaves, health benefits of curry leaf tree can be derived from its root, bark and fruit pulp (seeds of the berries are poisonous). Curry leaf or Kari patta has anti-inflammatory, anti oxidative, anti-diabetic, anti-microbial, carminative, anti-hypercholesterolemic, and hypoglycemic properties. It works as a stimulant, relaxant and mild laxative. Thus, it helps reduce blood sugar and blood cholesterol. In addition, it has been observed that curry leaves help reduce the size of a tumor by fighting cancerous cells. The herb is used as a natural cure for nausea, vomiting (when dealing with bilious vomiting, one teaspoon of powdered tree bark can be taken in two cups of water for a couple of times), stomach upset, and other digestive disorders. It increases appetite and improves digestive functions. Besides, curry leaves facilitate weight loss naturally through detoxification. Furthermore, having a teaspoon of juice extracted from roots of the tree, mixed with one teaspoon of honey, is known to relieve kidney pain. Here’s a video giving information on curry leaf tree. The herb contains volatile oil and oleo resins. It is a good source of vitamin A, vitamin C, vitamin K, calcium, iron, magnesium, manganese, amino acids, plant sterols, etc. As curry leaf extract helps reduce oxidative stress on pancreatic cells by restricting the action of pancreatic alpha-amylase enzyme, this herb is considered valuable in controlling diabetes. • Curry leaf benefits individuals suffering from hereditary diabetes and diabetes caused by obesity. All you have to do is eat 10 fresh curry leaves daily in the morning. Follow this therapy for at least three months. Needless to say, you also need to take other precautions associated with this disease. • Intake of juice extracted from curry leaves brightens the eyes and delays cataract. 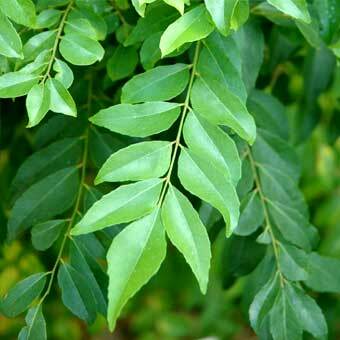 • Dry a few curry leaves in shade for 4-5 days. Take one teaspoon of this dried curry leaf powder and mix a teaspoon of honey in it. Consume this home medicine for about two to three times in a day to get rid of constipation. • Drinking the juice of 15-20 curry leaves mixed with a teaspoon of honey serves as an efficient curry leaf home remedy for diarrhea. • Simply consuming about eight to ten fresh raw curry leaves benefits in curing dysentery at home. • In the morning, pregnant women suffering from morning sickness can take juice of 15-20 curry leaves, mixed with one teaspoon of sugar and two teaspoons of lemon juice. • Having buttermilk mixed with a paste prepared from freshly chopped curry leaves provides relief from nausea and vomiting. Besides, you can soak some curry leaves in four cups of water for two hours, filter the solution and drink half a cup of the infusion three times in a day. • Drinking a cup of water mixed with one tablespoon of roasted curry leaves serves as one of the most effective curry leaf home remedies for nausea. • Taking a combination of juice extracted from curry, coriander and mint leaves is valuable in relieving indigestion. • Applying a poultice of curry leaves on the affected area helps heal burns and bruises. • Using a paste prepared from juice of curry leaves and turmeric powder heals and fades acne scars. Leave the mixture on the affected areas for about 15 minutes and then wash it off. • Applying a mixture of pulp of berries from curry leaf tree and equal amount of lime juice is useful in healing insect bites. • When dealing with issues like loss of appetite and tastelessness, have a therapeutic drink prepared by adding curry leaf paste, cumin seed powder, and black salt in a cup of buttermilk. • Take a handful of curry leaves (Karipatta) and boil them in one tablespoon of coconut oil until they become dark in colors. Use this mixture on your hair and wash it off with herbal shampoo after an hour to prevent and cure premature greying of hair. It also stimulates hair growth. 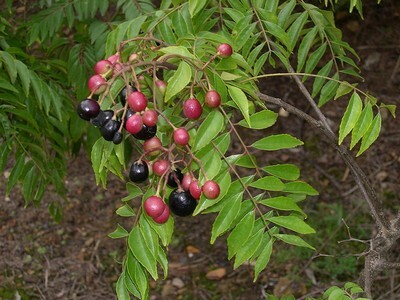 In addition, drink juice of curry leaves daily. Besides, another benefit of curry leaves is that they keep insects at bay. When storing this herb in the refrigerator, do not remove the leaves from the stalk. It is worth noting that the curry powder used in the Western countries is not actually powdered curry leaves but a combination of certain other spices that create a similar flavor. Curry leaf benefits health in several ways and there are no known side effects of this herb. curry leaves i use mostly every day in vegetables. I believe in this since so long though i am away from diabetes. curry leaf is a wonderful leaf it helps to grow hair and reduces dandruff also. i like it very much. I am eating 7 curry leaves, basil leaves and bhringraj leaves raw every morning. Feel active the whole day. Good True Post- It is a GOD created cure from Nature. My wife was putting on weight, she was 55 Kg, which was not suitable as per the ratio of her height and age. Doctor advise to skip dinner. She tried Curry Leaf remedy, drinking of curry leaves boiled water daily one glass in the morning for 7 days. She lost 5 kgs out of 55 kgs. Now offer curry leaves boiled water to her friend circle free of cost. sir ,did your wife loose 5 kilos in 7 days ? can you please elaborate on how long it took to loose 5 kilos using curry leaf juice ? Really like the article…never knew itssuch a helpful thing. But what do u mean by juice of curry patta …. Is it boiling leaves in water or squeezing there juice out…. Waiting for your response.